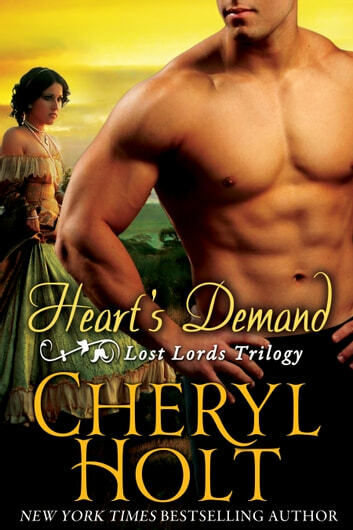 CHERYL HOLT delivers the exciting, gripping conclusion to her new trilogy, The Lost Lords of Radcliffe… BRYCE BLAIR was five years old when his family was ripped apart. But he was too young to understand what had happened to cause the tragedy. He grew up an orphan and charity case, but he always felt a great destiny waiting for him out on the horizon. As he investigates his past and discovers the hidden secrets about his parents, he learns that his deceased father was an African explorer. He decides to follow in his father’s footsteps by adventuring down the Nile in Egypt. Her Royal Highness, KATARINA MOROVSKY, is a princess without a kingdom. Her father was king of the small European country of Parthenia, and with his death, her despicable cousin seized the crown for himself. Katarina was stripped of her heritage and title. Worried for her safety, she’s fled her home country and traveled to Egypt. But life on the run is perilous and full of hazards. When she finds herself in need of a brave, trustworthy bodyguard, Bryce Blair seems the best choice. Bryce is fascinated by beautiful, mysterious Katarina and can’t help but agree to her request for protection, but it’s not easy to guard a royal princess. Nor is it easy to love her. With a throne at stake and fortunes in the balance, she will be a difficult prize to claim. But Bryce Blair—the Lost Lord of Radcliffe—has learned to fight and win any battle he wages. The last in this series a lovely story involving all the family members, a family as we would all love, I think there is another story about the mother and the last son.